As predicted the first International Goose count on Islay last week has produced a lower than expected count of just over 30,000 birds. The reason for this lower number is that very few juvenile birds have returned with the adult Geese due entirely to a devastating Spring blizzard in eastern Greenland. 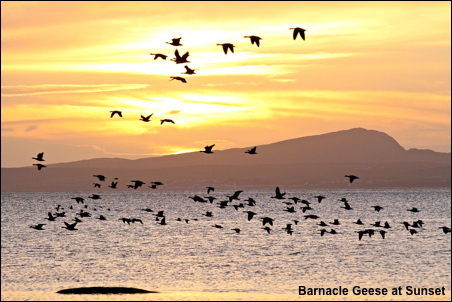 It was already known that Knot and Sanderling, that breed in eastern Greenland, had not been able to breed because of the snow cover.The Barnacle Geese that rear their young on Greenlands 200 metre sea-cliffs were expected to bring few young birds and that is exactly what has happened. Perhaps now they will be left to feed in peace on Islay?